Communist revolutionary and Soviet military leader Vladimir Antonov-Ovseyenko (or -Ovseenko) was purged on this date in 1938. 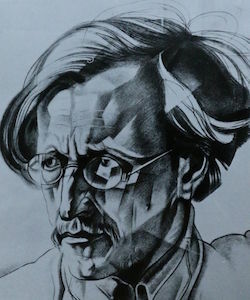 Portrait of Antonov-Ovseyenko by Yuri Annenkov. The Ukrainian was a radical agitator from youth; he was expelled from military college in 1901 at age 17 for refusing to swear loyalty to Nicholas II and proceeded thereafter upon a cursus honorum of revolutionary tribulations — albeit, until World War I, as a Menshevik. He stood in some danger of achieving these pages by the hand of the tsarist government rather than the Soviet one, on account of helping orchestrate the Sebastopol mutiny during the 1905 revolution, but his death sentence was commuted to hard labor. Nothing chastised, Antonov-Ovseyenko escaped and returned to that life of militancy suitable to his badass underground nickname “Bayonet”, organizing workers and publishing illegal newspapers while dodging Stolypin‘s police. After several arrests, he finally fled for exile abroad. According to Harold Walter Nelson’s Leon Trotsky and the Art of Insurrection, 1905-1917, it was in Paris writing for the red paper Nashe Slove (aka Golos) that the former cadet drew close to Trotsky, finding a common “conviction that the relationship between military events and the development of the revolution was critical,” and thereafter “Antonov-Ovseenko’s enthusiasm for columns on military topics opened the pages of Nashe Slovo to Trotsky’s articles” ultimately amounting to “several hundred pages of commentary on the war [World War I].” Ere long both figures would have opportunity to implement their doctrines on the battlefield. But the time for revolutionists’ exile was drawing to a close. Barely a year after the indignity of having his subversive exile ‘zine shuttered by the Third Republic, Antonov-Ovseenko — as secretary of the Petrograd Military Revolutionary Committee — led a posse of soldiers and sailors into the Winter Palace and arrested the Provisional Government, consummating the October Revolution. Despite Sergei Eisenstein‘s epic re-creation in October: Ten Days That Shook the World, and the 1920 live re-enactment staged by Nikolai Evreinov, the Winter Palace was barely defended and Antonov-Ovseenko entered and found the Provisional Government without meeting resistance. He offered amnesty for the surrender of the remaining Winter Palace holdouts, and the offer was accepted. Now a key military figure in the infant Communist state, Antonov-Ovseyenko helped clinch Soviet victory in the ensuing civil war, routing White armies in the Ukraine in 1918-1919 and putting down the Tambov Rebellion of peasant anti-Bolsheviks in 1920-1921. Antonov-Ovseyenko (center) chills with Red Army officers. By the later 1920s his Trotsky affiliation had significantly dimmed his star,** though he was still entrusted in the 1930s as a Soviet consul to several countries — the last of them the Spanish Republic during the Spanish Civil War, before falling prey to the purges mere months after his return. His son, the lately deceased Anton Antonov-Ovseyenko, survived 13 years in the Gulag to become a dissident historian; his The Time of Stalin, published abroad in 1981 after being smuggled out of the USSR by Russia scholar Stephen Cohen, was one of the milestones along the way toward the public reckoning with Stalinism. “An embattled personality and fearless” in Cohen’s estimation, Anton Antonov-Ovseyenko died in 2013, still directing a Gulag museum in Moscow even though he had long since gone blind. ** In The Time of Stalin, Anton Antonov-Ovseyenko alleges that his father considered betting on the loyalty of the army in a coup against the Stalin faction, back when control of the post-Lenin state was still uncertain. “This cannot go on for long,” runs one letter the young Antonov-Ovseyenko quotes. 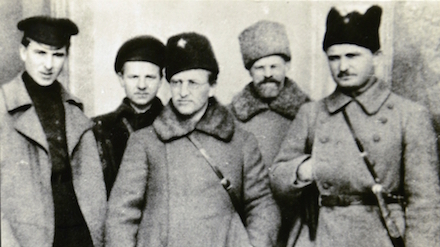 “There remains one alternative — to appeal to the peasant masses dressed in Red Army greatcoats and call to order the leaders who have gone too far.” Trotsky also wrote in his memoir that such a coup was mooted within their circle.